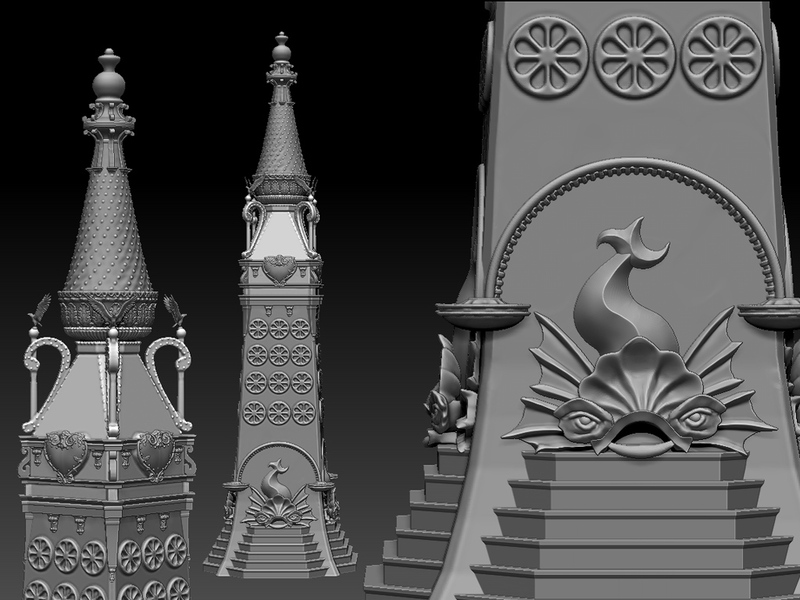 Luna Park’s Electric Tower- ALmost Ready for #3Dprinting ! My first model of the Electric Tower was designed in SketchUp and lacked the ornate detail of the original Luna Park architecture. that’s why I chose Zbrush as the software to model Luna Park with. The software allows for the kind of detail the original park had. Furthermore, the tower that is currently featured in the Thompson & Dundy’s Luna Park: 3D Printed by the Great Fredini installation at the Coney Island Museum (and coming to World Makerfaire New York this weekend) turned out to be the wrong scale. I’ve been hemming and hawing about remodeling it with better detail, but its finally ready for 3D printing. The tower changed from year to year so I’ve opted to create one of the most ornate versions of it that existed circa 1907 with the dolphin fountains at the base. This model is likely to take over a month to print as it needs to be approximately 7′ tall- I’ll have to cut it up into blocks that will fit on my printers and then assemble them. This entry was posted in 3D Printing, Art Projects, Coney Island, Luna Park, Scan-A-Rama and tagged 3D Design, 3d print, 3D Printing, architecture, Brooklyn. Bookmark the permalink. ← World Makerfaire New York, 2014, Here We Come!